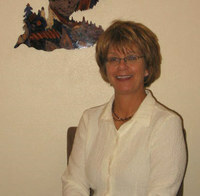 I have over 44 years of experience in the Laramie real estate market. I have had the pleasure of working for a number of real estate offices in Laramie, and am thrilled to now own my own company. I am proud of the reputation Mountain Valley Properties has grown to have in the Laramie community. I list and sell residential properties, new construction, vacant land, investment properties, as well as oversee daily business operations of the firm. Family is a very big part of my life. John and I have been married for 44 years. We have two children, Rob and Tara. They also live in Laramie with their families. I am a member of Laramie's First Christian Church and John and I are both active in the Laramie community. I am a member of the Laramie Business Alliance, served as the Vice President of Laramie Mainstreet Program, and serve as a Director on the Laramie Board of Realtors. I feel very fortunate that Mountain Valley Properties continues to grown and I believe it is through hard work, honesty, competence, and the highest level of integrity that has made this happen.